Our Kirkwall apartments are located at Craigiefield House, a short walk along the waterfront, past the marina, to the main town centre and provide guests with the opportunity to enjoy beautiful views over Kirkwall Bay. Go out on to Junction Road. Turn left and follow the road along to the ‘Kiln Corner’ roundabout, turn right, then carry straight on along the sea front, across the ‘Shore Street’ roundabout on to Cromwell Road. Follow this road out of Kirkwall onto Carness Road, you will see Craigiefield approximately 1 mile along this road on the right. The main driveway is the second entrance on your left as you go round the corner at Carness and is signposted. Turn right and follow the road into Kirkwall (approximately 3 miles). On reaching Kirkwall follow the road down Bignold Park Road, onto Dundas Crescent then Palace Road and onto Broad Street, past St Magnus Cathedral. This road leads you to a left turn at the Clydesdale Bank onto Castle Street, follow this road and turn right onto Junction Road. Follow the road along to the ‘Kiln Corner’ roundabout, turn right, then carry straight on along the sea front, across the ‘Shore Street’ roundabout on to Cromwell Road. Follow this road out of Kirkwall onto Carness Road, you will see Craigiefield approximately 1 mile along this road on the right. Turn left and follow the signs for Kirkwall. At the first roundabout take the first left, go straight across the next two roundabouts, then carry straight on along the sea front, across the ‘Shore Street’ roundabout on to Cromwell Road. Take the A965 to Kirkwall (approximately 15 miles). On reaching Kirkwall take the second turn off at the first roundabout, go straight across the next two roundabouts, then carry straight on along the sea front, across the ‘Shore Street’ roundabout on to Cromwell Road. Follow the road out of St Margarets Hope until you arrive at a junction. Turn left on to the A961 and follow the signs to Kirkwall (approximately 15 miles). This will take you across all of the Churchill Barriers, through the village of Burray, past the Italian Chapel and through the village of St Mary’s in Holm. Continue following the main A961 road. 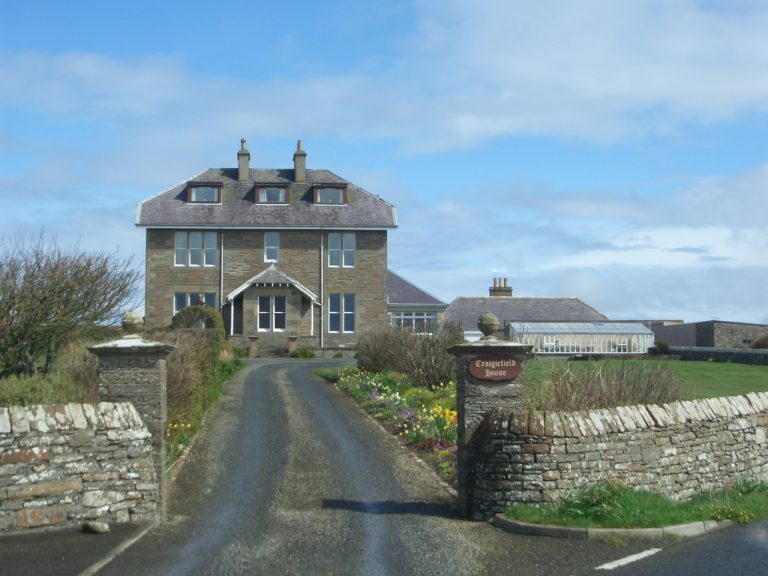 On arriving in Kirkwall you will drive past the Highland Park distillery – continue following the road as it veers left down the Holm Branch Road at the foot of which there is a new road layout. Take the third exit off the ‘Scapa’ roundabout which takes you on to New Scapa Road and onwards to Junction Road (you will cross a small roundabout and go past J&M McEwen furniture shop and the British Legion premises). At the end of Junction Road turn right at the ‘Kiln Corner’ roundabout, then carry straight on along the sea front, across the ‘Shore Street’ roundabout on to Cromwell Road, then Carness Road, you will see Craigiefield approximately 1 mile along this road on the right.